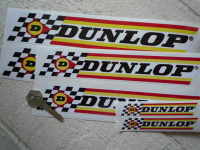 A pair of black, white & red, oval, Bell Helmets stickers. Black, Red, & White in colour. Machine cut to Oval shape with small white border (larger white background is backing paper and is not part of the sticker). 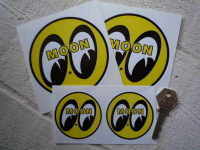 2.5" pair for £2.25 (each sticker measures approximately 60mm x 30mm). 3" pair for £2.50 (78mm x 39mm). 4" pair for £3.50 (104mm x 52mm). 5" pair for £3.99 128mm x 164mm). 8" pair for £4.99 (102mm x 204mm). Buco Helmets Protection Thru Research Oval Stickers. 1" Pair. 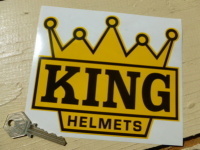 KING Helmets Black & Yellow Crown Shaped Motorcycle Stickers. 2" Pair. Barry Sheene. AGV Helmets Tri-Colour Stickers. 2" Pair. Buco Helmets Blue & White Oval Stickers. Style 1. 1" Pair. 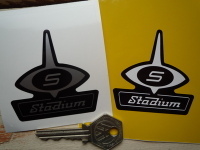 Stadium Jet Helmet Logo Sticker. 2" or 2.5". 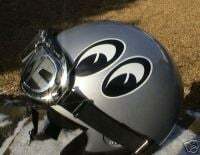 Griffin Clubman HP Black & Silver Helmet Sticker. 2.25". 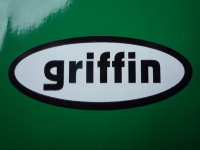 Griffin Helmets Black & White Oval Sticker. 3".